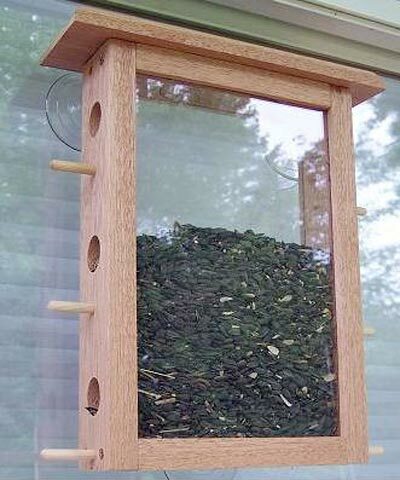 Interest your children in birding with the Coveside Six Port Window Bird Feeder. This innovative feeding station attaches to your window, for watching avian feeding behavior up close. A sturdy, mahogany frame creates a lasting feeder, with two plastic panels in the center for you to easily monitor seed levels. The reservoir accommodates 1.75 quarts of seed, and six ports enable birds to dine easily. A perch beneath each port offers birds a resting spot, and the top removes quickly for refills. The three silicone suction cups keep the item secured to your window, and its see-through design makes the feeder fun for the entire family. Enhance your bird watching with this Six Port Window Bird Feeder. Made in the USA.